1 For the batter: Beat eggs, sugar and vanilla sugar for at least 7 minutes at the highest setting of the hand mixer. Combine flour, baking powder, cocoa and salt and stir into egg mixture. Pour batter onto a baking sheet lined with parchment paper and bake in an oven preheated to 180°C (approximately 350°F) for 20-30 minutes. Remove and let cool. 2 Cut cake into 3 cm (approximately 1 1/5 inch) cubes.Cut each cube in half horizontally. 3 For the filling: Combine cherry juice and cherry brandy, then brush onto cakes. 4 Melt chocolate over a double boiler. Remove from heat and let cool slightly, then fold in mascarpone. Spread cream onto the bottom layers of cake, then add tops and chill for 1.5 hours. Heat apricot jam heat, pour through a sieve and drizzle onto nuts. Chill jam and let set. 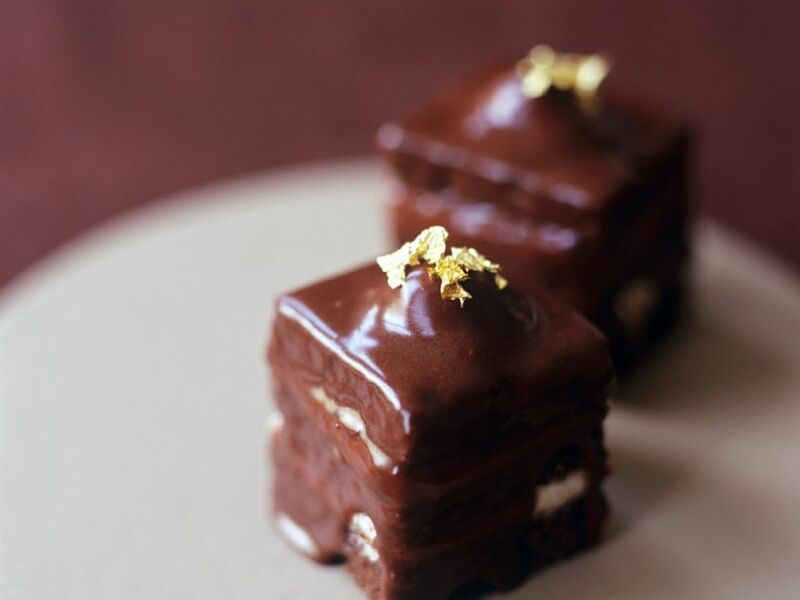 Top each petit four with chocolate icing, then add an apricot nut and serve garnished with gold leaf.